In the beginning of 2016 I delved deeper into yoga by completing my 200 hours yoga teacher training in New Zealand and ended the year, and began 2017 with a yoga retreat in the United States. Aside from practising the asanas, mantra chanting and meditation that are all part of yoga, it is the yoga philosophy which I call “life lessons” that has a profound impact on how I think, act and feel now. 1. The most important time is NOW. Life is short and nothing stays the same forever. Everything is in constant motion and change is inevitable, so enjoy, be mindful and live in the present moment. 2.The most important person is the person you spend time with NOW. Whether you are at home with your family, or at work with your coworkers or elsewhere with others, be mindful and present with them. 3.The most important pursuit is making the person you are with NOW happy. For me this means bringing joy to those around me, so be kind through thoughts, words and actions. Whether it is things, people, emotions or situations, letting go is essential to be able to live in the now and enjoy it at the same time. What is done in the past cannot be undone, so it stays in the past, and the future is uncertain, so why not live in the present? Also letting go of things that no longer serves you is important, whether it is a relationship that has run its course or possessions that may be tying you down or you actually no longer need, but you’re still hoarding it. 5.To spend time in nature as it grounds us in the present moment and calms the mind. 6. To trust the universe to provide. Trust what you’ve done, it is enough. 7. To stay open-minded and open-hearted. When you do this, you’ll be surprised by what you learn from people and situations and most importantly, about yourself! In order to help others and be there for them 100%, taking care of self first is crucial, so “me time” is not selfish and it’s also a form of meditation. 9. To cultivate an attitude of gratitude. It has been scientifically proven that grateful people are physically and mentally healthier, experience more joy, have higher self-esteem and are more resilient in difficult life circumstances. Therefore, practising gratitude is a no brainer! On a daily basis we tend to forget to breathe deeply due to our hectic modern lifestyle. Inhaling and exhaling deeply has great benefits for our health such as reducing stress and promoting relaxation, and improving the digestion. In addition, breathing deeply equates to longer life. I hope this post inspires you to live mindfully and joyfully this year. Katrina Mayer, author and motivational speaker, once said: “Time spent in nature heals your body, mind and spirit.” I found this quote to be especially true as I enter the last leg of my year-long travel journey. After a few months of nonstop travelling from country to country, and then settling back into life in Taipei as a student learning Mandarin once again, I felt I needed a little getaway to reflect, relax, rejuvenate and reconnect with myself. Call it divine intervention or whatever you will, one night as I’m googling away on my laptop searching for travelling to Taitung, I found out about a yoga retreat taking place there at the end of June. I’m so happy to have discovered Teacher Joe’s (Joe 老師) 3 days/2 nights yoga retreat in the scenic Eastern tropical region of Taiwan. The sceneries along the way from the train station to our retreat centre in Duli, a small village in Taitung county, was absolutely breathtaking: trees so green and lush, and the ocean has 3 to 4 different shades of blue. After seeing this, I now understand why the Taiwanese always recommend people to go to Taitung. Fewer people come here, so it seems as if it is untouched by the human hand. It’s like nature in its true form. I love the secluded area of the retreat centre called Oceantree Yogasurf Ecocamp (https://www.facebook.com/TYTguesthouse/). It is run by a very down to earth and extremely welcoming couple, Mark and Kite, and they have two very cute children, plus two friendly and docile dogs. Mark teaches surfing, while Kite teaches yoga. From here, I really felt in tune with nature, from listening to the singing of the cicadas,to the chirping of the birds and sounds of the ocean waves. Seeing the neighbouring pineapple field and the farmers harvesting the pineapples, and then eating the pineapples in our vegetarian meals was an incredible experience. I always thought that pineapples came from trees like coconuts, and never thought to investigate it. When I discovered they actually came from the ground, I was in awe and once again am reminded that in life, we take a lot of things for granted, or it’s based on our own ignorance. At that moment, I made a pact to be genuinely more aware of things around me and not to take things for granted. The vegetarian meals in the retreat was a reminder to eat healthy and of the connection between earth and us. I’m inspired to cook healthy homemade vegetarian/vegan meals when I return home to Canada, thanks to this retreat centre’s talented creative chef Jake! 1. My Mandarin has improved a lot since last year, despite taking a 4 months’ break from it. I was comfortable being in a full-immersion Mandarin speaking environment. For the most part, I understood what everyone was saying and I could communicate with them. Of course at times I would be confused, and could not find the right vocabulary or grammar pattern to talk. I’m still learning the language. At the same time, I realize that taking a break from a language and then getting back into it truly works! 2. Sometimes you just have to cast your fear aside and not think about anything, and do it. Thanks to Mark’s encouragement and attitude that “surfing is fun and like playing in the water”, that is exactly what I decided to do for my first surfing lesson. I have always been afraid of the water even as a kid even though my parents put me through swimming lessons. In the process of letting go, I learned that I love surfing! It is so fun and it is definitely something I want to continue so that goes hand in hand with relearning swimming as an adult. 3. Another huge fear I have decided to cope with this year throughout my travels is to try to overcome my phobia of dogs. In the past if a dog came near me, I would be freaking out, jumping up and down, and even getting on the table to get away from it. Therefore I cannot be in the same room with it. Two months ago, after meeting a very well-trained dog in Macau, I guess I got some courage to see if I can continue to be closer to dogs. This time even though I’m still apprehensive, I noticed that it is okay for me to be in the same room with them if they are well-behaved like Mark and Kite’s dogs, as long as they don’t pay too much attention to me. 4. I used to think that I’ll never be able to do aerial yoga because it requires a lot of flexibility and doing craziness high up. It is amazing to discover what happens when there is a very good encouraging yoga instructor (thank you Joe 老師!!) and when I let go of my doubts. Aerial yoga is actually not as difficult as I perceived it to be, and it is really fun!!!! -Waking up early at dawn to do beach yoga as we listened to the sounds of nature (ocean waves, birds and cicadas singing) around us, and seeing the sunrise. -Facing the pineapple field and feeling the ocean spray touch my face once in a while as I’m reading about mindfulness in my quiet spot. This summer I traveled to New Orleans, Louisiana to get my kids yoga teacher certification. One of my favourite moments during training was a 20 minute drawing and breathing activity where we reflected on who we are in an authentic honest way. It seems we are constantly surrounded by noises, chaos and the hectic pace and demands of our daily lives whether it is from our family responsibilities, work tasks etc. I find it especially true in the twenty-first century whereby technology or social media plays a really big role in most people’s lives. In the process of meeting the demands of this pace of life where we just live on “autopilot”, we lose ourselves, the core of who we are. There is no time to really think about who we are and what we want to do in our lives to be truly happy. It can be so dire, that some people experience mental, physical and emotional burnout and depression overtime. This drawing and breathing exercise reminded me once again how important it is to really “pause”, whether it is for a few minutes or one hour out of our daily lives to simply breathe and connect with ourselves and think positive thoughts. Remember: “You are what you think.” These positive thoughts are essentially positive affirmations that help us to realize and actualize our potential and dreams. One of my dance instructors once shared with us her positive affirmation. She said that every morning when she wakes up, before she does anything, these are the words she utters: “I am happy. I am healthy. I am blessed.” We all thought it was a beautiful way to start the day. As part of her class, we made it into our routine to end the class with these words. I truly felt these words and believed it about myself as I continued my everyday life. They can be as short and simple as my dance instructor’s or as long as mine or anyway you want them. It only matters that you are finding time to pause, breathe, reflect and believe in the power of these two words: I AM. Go and try it, and see how powerful your own positive affirmations can have on your life to achieve genuine happiness! For the past 6 months, I’ve been busy preparing for my year abroad, from researching, getting paper work completed to finally packing! I feel blessed that my profession allows me to take time for myself to rest, reflect, rejuvenate and grow. I’m really excited that I’ll be combining my love for travelling, meeting new people, and embracing new cultural experiences with my passion for learning during my sabbatical. To be precise, I’ll be learning Mandarin and getting deeper into yoga! In fact, my travel abroad adventure began in The Big Easy (New Orleans) last month already where I completed my Kids Yoga Teacher Training with an amazing Canadian trainer, Aruna Kathy Humphrys of Young Yoga Masters, and a wonderful supportive like-minded group of American classmates. Sightseeing in New Orleans and eating tons of mouth-watering Southern food has always been on my bucket list, and I’m happy I checked that off! Fast forward to now, I’m currently living in Taipei. I flew here a week ago and am slowly getting over jetlag and settling into my new home. I’ve enrolled in a university program to learn Mandarin for foreigners at the National Taiwan University, and am looking forward to beginning class next week! While Taipei will be my home base for the next 12 months, I also have some travel plans for New Zealand, Australia, Bali and other places that I’ve yet to decide on. One of my good friends shared this quote with me: “To travel alone is to get lost on purpose, in order to be found.” I hope this quote will inspire me to find my own true path as I travel physically, mentally and spiritually throughout some parts of the world. I can’t wait to share my everyday travelling/learning adventures and bucket list with you and thank you for being part of my journey here! Being Thankful: Life’s a Piece of Cake! It’s our Thanksgiving in Canada, and as always it’s time for many of us to pause, reflect, surround ourselves with loved ones and be thankful for all we have in our lives. Over the Thanksgiving long weekend, I caught up with my vegan friend, Emma, whom I met this summer in Korea and we became really good friends in a short span of 3 weeks. 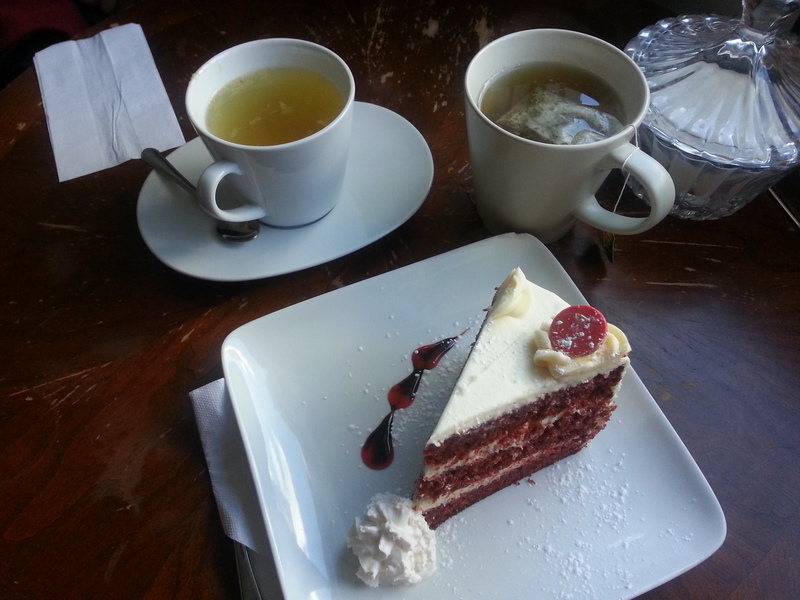 We decided to meet up in my favourite Korean cafe in town since we both miss our time in Korea and wish to reminisce the good times we had this summer. You may argue, but what about the “bad” things that happen to us in life? Well, I will argue it’s all in our mindset: the way we look at and interpret events that happen to us. Don’t you think that when we over-think, our minds go in turmoil and that’s when we find our lives are complicated? Even with uncontrollable events that happen to us, we can look at it from a different lense. This lense is what I call the positive mindset. When we cultivate a positive mindset, things in life become crystal clear and simple. Yes, we will stumble along the way with challenges and have unexpected detours, but in the end, we become stronger and find something that is beautiful and are more appreciative and happier than we can ever imagine. If we don’t experience such challenges in life, how can we realize how sweet that piece of cake is? Just take a moment and think how powerful positive thinking can be. For me, it makes me be thankful that I am alive and breathing, and can enjoy that piece of cake fully! In addition, I am thankful for my family, old friends I still keep in touch with and new friends I made through my life’s adventures! Wishing you all a bountiful, beautiful and peaceful Thanksgiving! 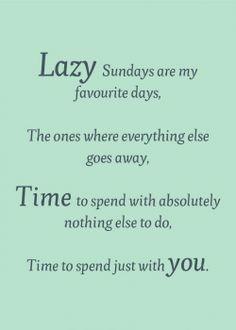 Lazy Sundays are Good for You! The past 2 weeks have passed by like a whirlwind. I’ve been so busy adjusting back to my regular and new routines, also fitting in socializing and family times that I realize I am neglecting something very important in achieving work-life balance. It is ME! My lazy Sunday reminded me gently that all of us have to slow down once in a while and really listen to what our body and mind need to rejuvenate our soul. Having “Me” time allows us to enjoy and live in the moment and makes us feel more calmer, re-energized and confident in dealing with anything that comes our way in the upcoming days. My First Book Review & Giveaway!!!! 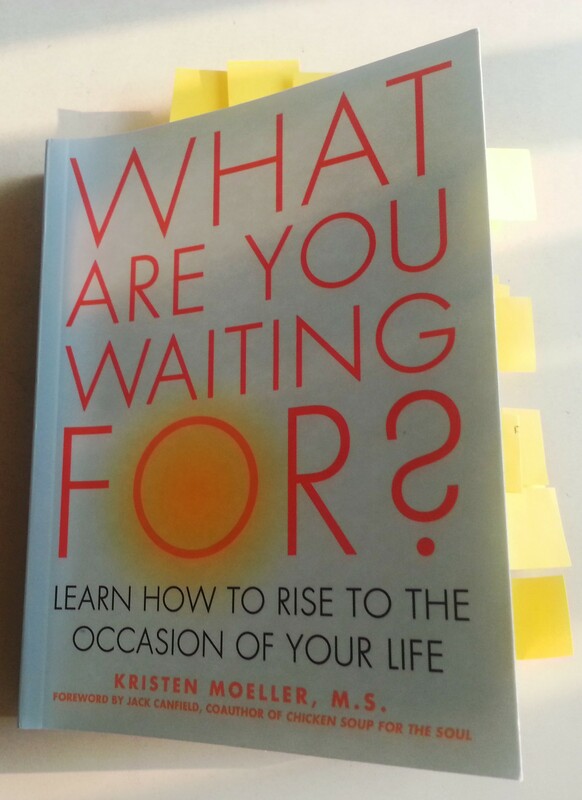 Viva Editions (http://www.vivaeditions.com/features/about.php) was kind to provide me a copy of Kristen Moeller’s What Are You Waiting For? : Learn How to Rise to the Occasion of Your Life. I finally had time to finish it this week and will give an honest opinion of this book now. After losing her beloved home and all her worldly possessions to a wildfire, Moeller writes this book, contemplating and reflecting upon life and what it means to “wait”. She writes in a personable voice, sharing her own experiences and thoughts with the reader, and guiding the reader along in her journey as she uncovers what “waiting” means. In essence, she is saying that most of us are always waiting for the right moment and/or person to find what we perceive as “real” happiness and fulfillment. As a result of all this waiting, we lose our freedom to simply be. She defines “be” as “that deep-down, knowing sense of who we are and what we are made of, that quiet peaceful voice that tells us we are OK, the ease of feeling at home in our own skin.” (p. xxxi) In short, she says we need to stop waiting for life to slow down and things to settle; we need to go forth to pursue our dreams, hopes and fears in all the messiness known as life. At the same time, we need to know when it is the right time to stop and wait. This type of waiting is seen as a kind thing we can do for ourselves because we learn patience, acceptance and allowance which will transform our souls in the face of fears and hopes etc. I have to admit that there are some chapters that did not resonate with me, such as Chapter 8 (“Waiting to Become the Person My Dog Thinks I am”), since I don’t have pets so I don’t love them as if they were my children. However, for pet/dog owners, this chapter may give you insights in becoming an even happier person. Overall, I’m glad I got a chance to be introduced to this self-help book, and to get to know this author. This book served as a gentle wake up call for me to look within myself and to see what truly matters to me and to be reminded of how I will pursue my happiness and fulfillment through wise waiting and fearless actions. 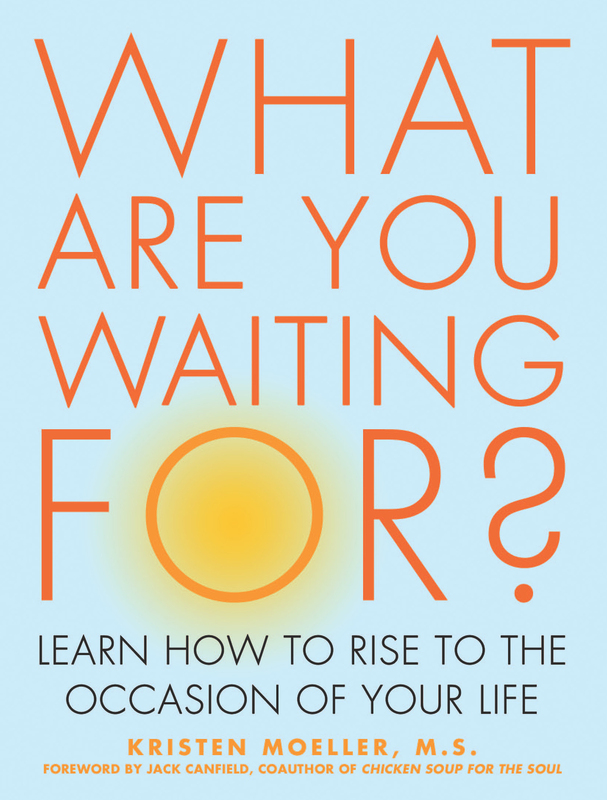 If you find you’re in a rut or you’re dissatisfied with your current life, or you’re waiting for that “something” to happen and then life will be good, then this book is for you! This giveaway contest is open to anyone 18+ anywhere in the world, as long as you are a verified follower of this blog. Simply enter your reply by pressing the “Leave a Comment” button below this blog post, and submit your answer. I will pull the giveaway participant’s name from a randomized generator. The winner will be announced and contacted via email on July 31, 2014. Thank you for reading this long post and I hope you will participate in this giveaway opportunity!